When you modify a configuration with the Designer at deployment time, these changes may impact the database schema or the components settings. Depending on the impact, it might be necessary to create a new deployment version. The deployed configuration files are written into the deploy folder from the Designer work directory. A subfolder is created in the deploy folder per application. The configuration from the deploy folder is imported into Repository. Depending on updates, the application version is incremented or not. A REST call is sent to Datastore Client to configure Datastore Runtime with the configuration from Repository. 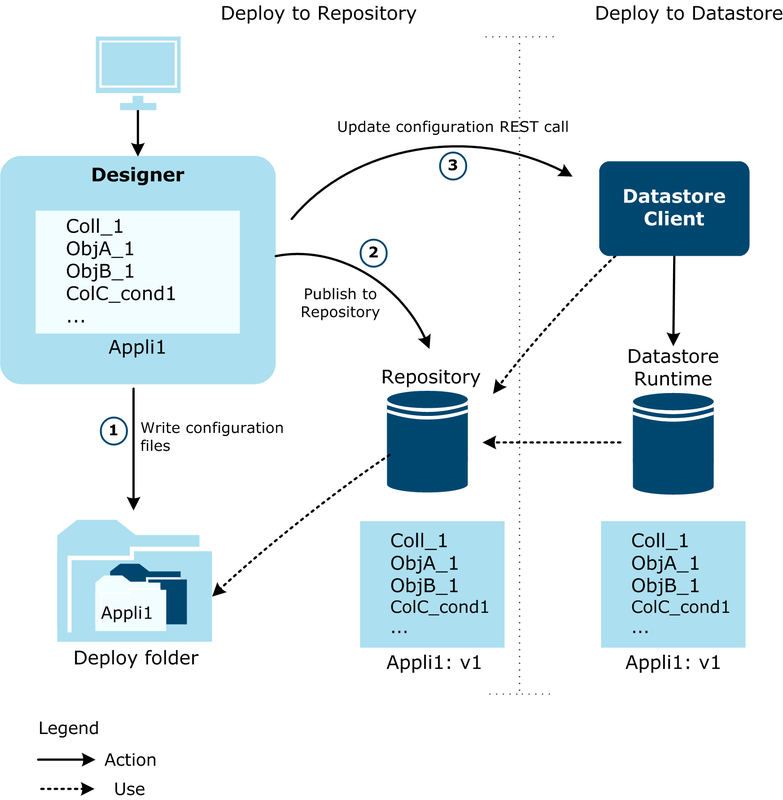 Datastore Runtime adapts its database structures to manage the updated configuration. A REST call is sent to InterPlay to adapt its database structures to manage the updated configuration. Note If the changes from the Repository configuration are not compatible with the Datastore Runtime or the InterPlay configuration, you can clean the configuration from the Repository only and redeploy a valid configuration into the Repository and Datastore Runtime or InterPlay. To change the structure of an existing Collection Type or Object Type, a new version for the Collection Type or the Object Type must be created. Note If you are in a test environment and you do not want to create a new version for an Object Type or a Collection Type, in order to deploy the above modifications, you can clean the configuration from Repository and component and redeploy the modified one. For InterPlay, if the configuration containing the new versions is deployed into Repository, the new versions are added to the associated application and the application version is increased. 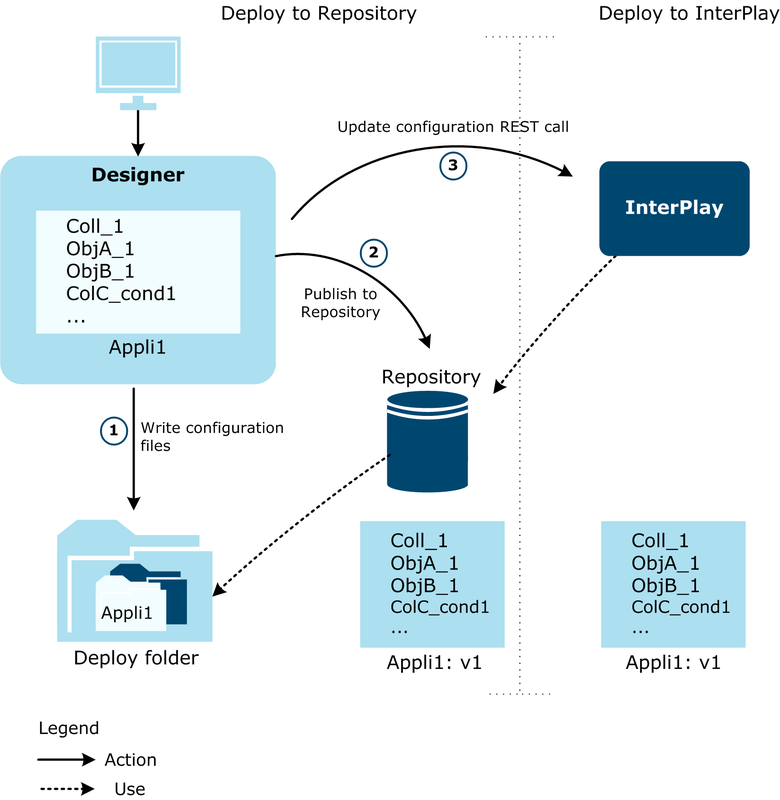 InterPlay / Datastore adapts its database structures to manage the updated configuration and increases its runtime version. Adding new types as a new Collection Type or a new Object Type has the same effect.